The Geometry Sky Tower Montessori material is used to practice geometric vocabulary. 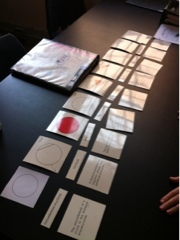 Here, a student completes the "Parts of a Circle" activity. Mr.Trent this is Kayla B. are we allowed to write our essay using a character? Hi, Kayla. No, please write this as a research paper, not a narrative. You should only report your research in a straightforward way, without using the word "I" or stating your own opinions.